The Alaska Zoo offers a unique and classy venue with a "wild" twist! Our multiple rental areas provide opportunities for indoor and outdoor settings. Our Gateway Hall offers an indoor venue popular for weddings, receptions, conferences and meetings. We offer a full kitchen facility with restrooms adjoining the space, in addition to tables and chairs for rentals. Our Gateway Hall also has an integrated sound and DVD/CD system with flat screen televisions and a built-in projection screen. Gateway Hall capacity is 150 people. We also offer a smaller greenhouse venue (capacity of 50) which has the option of lawn rentals in the summer (lawn adjacent to greenhouse). Our lawn rentals can accommodate over 300 people in an outdoor setting within the zoo, with a covered stage for shows or talks. The lawn is great for company picnics or parties, along with wedding receptions. Our Coffee Shop also offers a back room venue for smaller birthday parties for children. All rentals include options for zoo time, guest passes, animal encounters and more for additional fees. Please contact us for a showing and reserve your rental facility at the Alaska Zoo today! 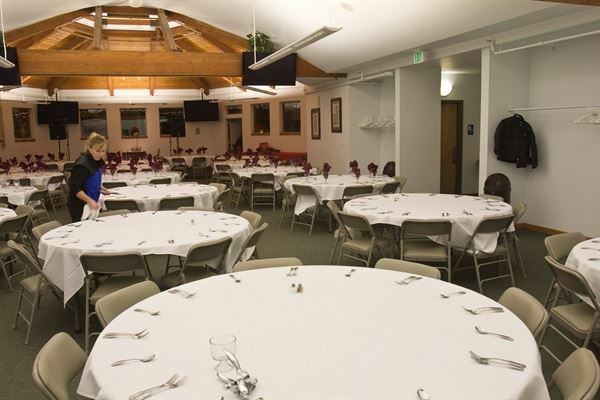 Please visit our website at http://direct.alaskazoo.org/gateway-hall-rentals to learn more about our Gateway Hall rental package. View and download our Rental Contract with all additional information listed. Please visit our website at http://alaskazoo.org/lawn-and-greenhouse-rentals to learn more about our Greenhouse rental package. View and download our Rental Contract with all additional information listed. Please visit our website at http://alaskazoo.org/lawn-and-greenhouse-rentals to learn more about our North Main Lawn plus Greenhouse/Lawn Combo rental package. View and download our Rental Contract with all additional information listed. Please visit our website at http://alaskazoo.org/lawn-and-greenhouse-rentals to learn more about our South Lawn rental package. View and download our Rental Contract with all additional information listed. Beutiful green house in the heart of the Alaska Zoo.